I am pretty sure I’m not the only one that loves Nutella. Quite literally on almost everything. Ok actually literally on absolutely everything. I haven’t used it much in baking before which is why this super easy Nutella pie is particularly exciting. I didn’t think it was possible to love Nutella even more but when it is all warm and melty, it truly becomes the stuff of dreams. Combined with rich buttery pastry, you’ll be in heaven! 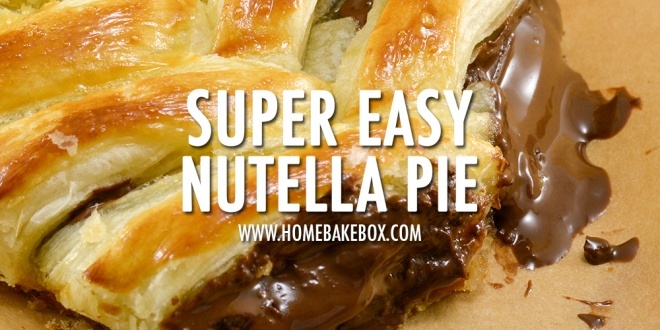 So what do you need for this Super Easy Nutella Pie Recipe? It’s a really really short list actually. I suppose if you wanted to, you could try making puff pastry from scratch but I personally am more than happy to keep things simple with the store bought version. And the method is super simple as well. Bring your puff pastry to room temperature and then roll out on a floured surface to about 1/2 inch thickness. Brush the side facing up with butter. Over a gentle heat, warm your Nutella and stir in your milk chocolate and hazelnuts. Allow to cool and thicken back to normal. 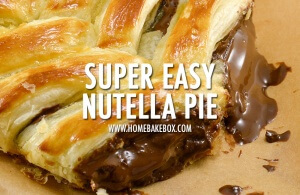 Scoop your Nutella mixture down the middle of your puff pastry sheet, leaving about 3 inches either side form the edges. Slice into the sides of your pastry sheet and fold over the center into a braid, all the way down. Transfer to a greased baking sheet and brush the outside thoroughly with butter. Bake according to the puff pastry packet instructions. The one I use is usually 220°C (or 200°C fan assisted) for about 10 minutes. Remove from the oven. If you want it gooey in the middle, serve warm. If you want it to cool and thicken, allow it to cool to room temperature – or chill in the fridge. The extra milk chocolate gives it a wonderful thickness and creaminess. And there you have it. Perfect Nutella pie, with a very short list of ingredients, and probably only about 10-15 minutes to make! What more could you want! For more, please do check us out on Instagram!